Named after MIT's 12th President, The Howard W. Johnson Athletic Center features an ice rink, a six-lane indoor track with a mondo rubber running surface, and four tennis courts. The track facility is also equipped with a large indoor field used for large-scale events, as well as a small weight training center. 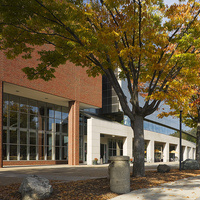 The building was completed and dedicated in 1988. This was a super fun event. Looking forward to it next year. This was such a great event! Can't wait for the next one. Terrific event and a wonderful way to get the community together on a student holiday. The energy was great, everyone was hands-on creating things and showing off their creations. Also, special kudos to whoever picked the music playlist!